It's a thought that's been brewing in the back of my head for a while, but there is no more mistaking it: Princess Charlotte looks exactly like Queen Elizabeth II. And I mean, spitting image, if-someone-took-the-Queen's-head-and-put-it-on-a-baby-this-would-be-it type lookalike. The ~royal twinning~ was officially confirmed for me by seeing those Buckingham Palace balcony photos from the annual Trooping the Colour event over the weekend, where Princess Charlotte was unmistakably channeling her great-grandmother. And I'm not the only one who noticed — royal watchers have been thinking this since the moment of Charlotte's birth. While it's inevitable that people of the same family are going to look alike (though William is looking a bit more like Prince Charles these days than Princess Diana), Princess Charlotte and the Queen take things to a whole other level. An absolutely adorable level. Because at the end of the day, is there anything sweeter than babies and little old ladies? The answer to that is yes, and it is babies and little old ladies who share the same face. Check out six of Princess Charlotte and the Queen's #twinning moments below. There are definitely shades of mum and dad in this one, but those eyebrows and lips are all Granny. Same chubby cheeks and rounded chins. Then nothing will. Charlotte is the Queen reincarnated (while she's still alive). 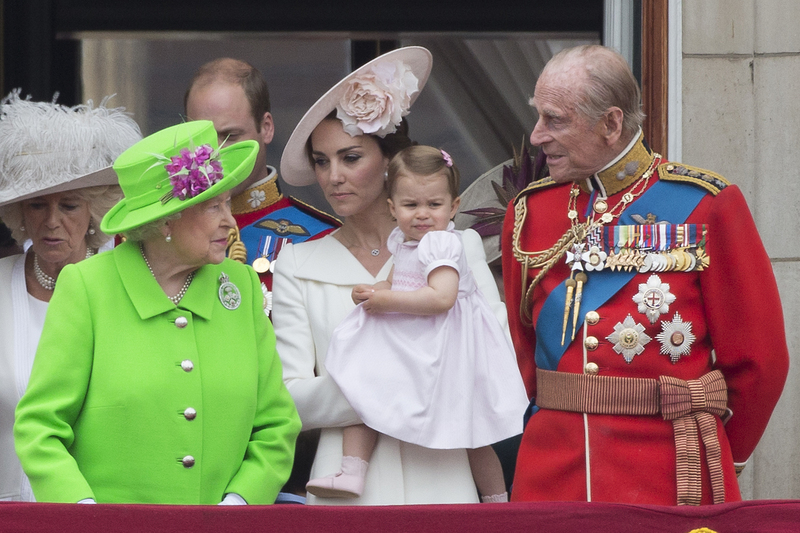 Take one look at this photo and tell me that Princess Charlotte isn't a baby version of the Queen. Do it. But that's OK. Princess Charlotte will have a lot more royal events ahead of her to prove her twinning.